HMI lighting (hydrargyrum medium-arc iodide) is a daylight-balanced 5600K lighting option that can accurately replicate the appearance of natural sunlight. It provides between four and eight times the brightness when compared with tungsten lighting of the same wattage. 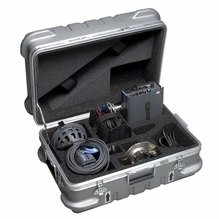 This means that HMI lights are excellent for use as daylight theatrical lights, for lighting film set interiors with daylight or for creating "fill" light while shooting outdoors. Many photographers like HMI lights because they provide a constant light source with the same color temperature as your common photoflash. Constant HMI light allows photographers to shoot stills or videos, whereas photoflashes are only used for still photography. 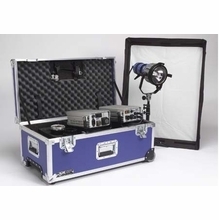 BarnDoor Lighting has multiple HMI daylight lighting kits that are portable and energy efficient for providing an extra lighting punch on location. You can easily plug these kits into wall power and keep all of their components organized and protected for quickly grabbing an item on the go. They're perfect for fast-paced environments where you're always packing and moving or running and gunning. They produce less heat than tungsten light kits, so they keep your talent comfortable during long scenes. 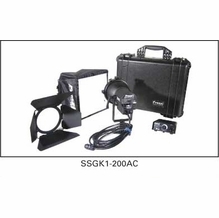 We offer the popular K5600 Joker 800W HMI Light Kit as well as Mole-Richardson HMI kits and Arri HMI kits at BarnDoor Lighting Outfitters. Looking for expert advice? 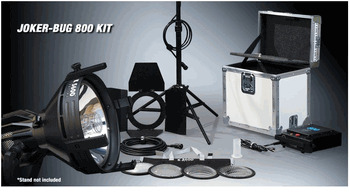 Our team is happy to assist you with all your production lighting equipment needs. We pride ourselves on going the extra mile to get you the right answer. Contact us today a by phone at 1-888-276-3667 or by e-mail at info@barndoorlighting.com.